This impressive villa enjoying stunning sea views. 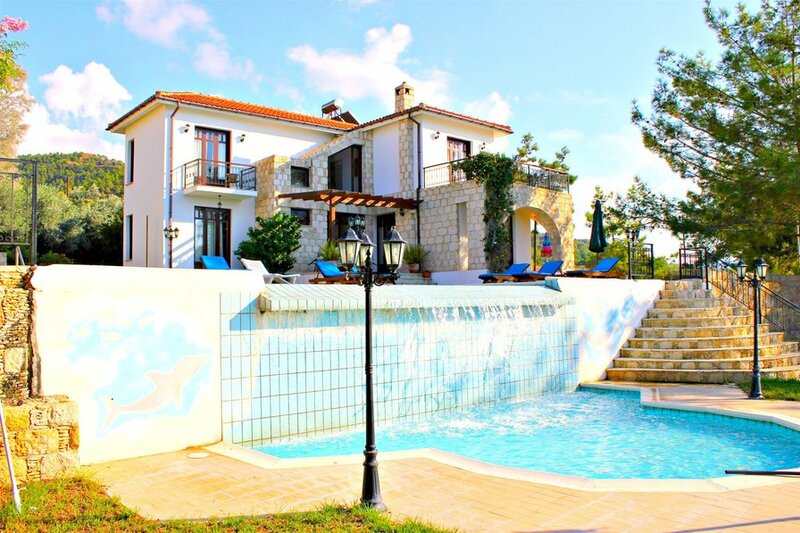 This luxury villa is located in Argaka and is a luxury, stone-built, villa with a very large pool and a tennis court.This villa lies on the edge of the Paphos forest and it overlooks the Mediterranean Sea. It provides a beautiful mountain view. Its' location is perfect to explore the neighboring areas of the west cost. Nestled in lusciously green orange groves it offers both sea and mountain views.On entering you will find an open plan ground floor, the living area is tastefully furnished and has a useable fireplace, for entertainment there is a television with satellite (limited channels) and DVD player. The dining area has a formal dining table and six chairs. The kitchen is fully fitted with a large fridge/freezer with ice maker, electric oven and hob, microwave, dishwasher, washing machine and wine cooler. The first bedroom with double bed and ensuite shower room is situated on the ground floor along with a separate cloakroom. The remaining three double bedrooms each with ensuite facilities and a private balcony are located on the first floor. The master bedroom features an ensuite bathroom. Living room Satellite TV, DVD player, CD player, fireplace. Outside Balcony, BBq, gazebo, garden, parking, lawn, garden chairs, sun beds. Swimming pools Private pool 6 x 12m with side overflow to ensure sparkling water.